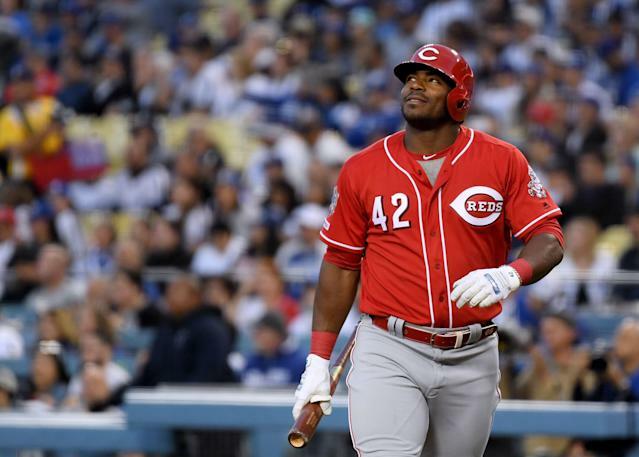 LOS ANGELES — “Testing, one, two, three … ,” said the man in Yasiel Puig’s chair. This was Monday afternoon at Dodger Stadium. This was long before Yasiel Puig got to the ballpark, long before he was announced batting third and in right field, drawing an extended ovation, long before he doffed his cap to the fans, long before he hit one of Clayton Kershaw’s first sliders of the season over the fence in center field, and long before Joc Pederson homered over his head in the bottom of the ninth to end his day. Long before any of that. This, of course, was neither news nor entirely unexpected. “I can’t tell you when he’s going to be here,” the man said. This was met by a couple dozen reporters with soft laughter, the appropriate response for when the easy joke becomes absurdly easy, so much so that it doesn’t have to be made. Doesn’t have to be thought. Just sits there with its pants down. Nobody clever enough to top that, or try. 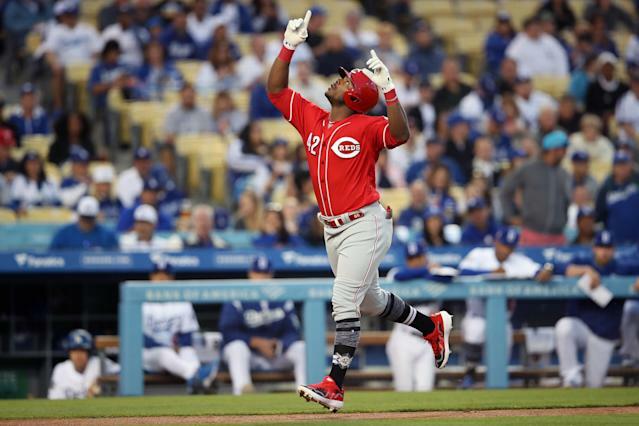 The Los Angeles Dodgers on Monday night would host the Cincinnati Reds, to whom Yasiel Puig, among others, including Matt Kemp, had been traded in December. This, then, would be Puig’s first day back in the stadium that was his home for six seasons, for six postseasons, for the Teen Wolf days and Wild Horse nights, for the missed cut-off men and ignored base coaches, for the Madison Bumgarner jostling and Nick Hundley jawing, for the crotch chops and tongue waggles, for the schedules made and not. And, I don’t know, maybe some bad stuff too. Then not-Yasiel Puig in the Yasiel Puig chair, having time to fill and no Yasiel Puig to fill it, said he’d had a nice omelet with avocado and bacon at a place in Pasadena that morning, sat out on the patio and everything. This was met with polite nods and subtle glances toward the door. On Monday, Jackie Robinson would be remembered for the day, in 1947, he broke baseball’s color barrier, in this the year he would have turned 100. His widow, Rachel, and children attended. And then the Dodgers would play a baseball game. In it, Kershaw would make his first start of the season. The three-time Cy Young Award winner had been recovering from a sore shoulder. Kershaw vs. Puig seemed reasonable theater for a mid-April Monday. But, first, an old acquaintance, the Cuban outfielder, the man who lit up so many nights against the San Gabriel Mountains, who did not scare in October, the man who was just a little more than a few teammates, coaches and managers could stomach, who was loved by the people who filled the seats and helped pay the bills on the old place. Those who worked with him swore it was a chore, sometimes more than they could bear. They did their grousing anonymously, where it was safe. And many of his transgressions were kept hidden, for the good of all. The door opened. A woman burst into the room. Neither was she Yasiel Puig. The chair, his for an hour and nine minutes, empty except for the guy who’d shared the story of the unholy patio omelet, awaited. “Hola,” he announced in a voice gravelly, almost sleepy, unamused, unapologetic. He wore a black shirt that honored Jackie Robinson and jeans. His sneakers were red. His agents stood in the corner. They’d waited like the rest. He answered some questions in Spanish and then, in English, was asked about his new town, how he liked it there as opposed to, you know, here. They go to dinner a lot together there, he said. The other players talk to him. Joey Votto is a great man, he said. They have lunch together sometimes. Everybody there works very hard, he said, which has spurred him to work harder than ever, which is what he meant back at spring training when he said he was going to work harder now that he is a Red and in his final season before free agency. He showed up batting .163. The Reds were 5-9. Perhaps, perhaps, perhaps … he understands the Reds, as a franchise, are slightly more fragile than the Dodgers were. That it might have been a thrill to spin the Dodgers on his finger when the adults were coming out of their seats, so protective. That the Reds might actually break. And he’d feel bad about that. That might’ve been further emphasized, too, had he been standing outside the visitors clubhouse Monday afternoon, when fellow former Dodgers Kemp, Kyle Farmer and Alex Wood were receiving their National League championship rings. Team owner Mark Walter, president Stan Kasten, general manager Andrew Friedman and manager Dave Roberts knocked on the door with enough rings for everybody. “Yasiel didn’t make it,” Roberts reported. “I haven’t talked to him and his teammates didn’t know either,” Roberts said. Puig shrugged. He said the Dodgers had plenty of alternative forms of delivery. They could’ve just handed it to the visiting clubhouse guy. Or not. They’d know where he was during batting practice. Or not. He saved the sentimentality for the people who would surround him in right field, those along the line and in the bleachers, those who would not grow weary of him, who would allow his fussiness, hardly cared at what time he showed up for work, and kind of liked it when he was too loud and wholly stubborn. They’d actually be a little conflicted when he came up in the first inning, one out and a man at first base, and lashed a home run to center field (the only runs Kershaw allowed across seven innings). And followed it with his eyes for a beat too long. And tossed aside his bat. And hoisted his right forefinger to the sky as he rounded first base. And celebrated near home plate with a bunch of strangers. When they cheered him, he said, “I might cry. "I haven’t seen the games. I don’t know how many people, how many fans, have been coming here. But I am sure that when I played here there were more fans." He was the last one off the field late Monday night – last in, last out – when the Dodgers celebrated without him. He put his head down and trudged to the dugout. He said he’d felt “something special” on his first day back, that it made him “happy.” That it would have to do. He’s not one of them anymore, and that seemed fine. With everyone.